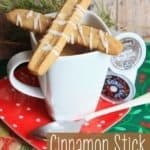 These light and crunchy cookies have a light cinnamon flavor and a sweet glaze - absolutely perfect for dipping in coffee! A great Christmas cookie to give as a gift as well! In a stand mixer, combine butter, sugar, brown sugar, and eggs until creamy. Mix flour, baking soda, and cinnamon in a medium bowl until well combined. Gradually add dry ingredients to sugar mixture. Line a loaf pan with plastic wrap and press cookie dough into pan. Try to be as even as possible. Refrigerate 1 hour until firm. Remove cookie dough from loaf pan using plastic wrap to lift. Slice cookie dough in 1/2 inch slices. Then cut each slice into 1/2 inch strips (about 4 per slice). Lay strips on GREASED cookie sheets about 1/2 inch apart. Bake until lightly browned at 325 for 11-13 minutes. Cool on wire racks. While cookies are cooling, mix powdered sugar and 2 tablespoons milk. Keep thinning out with milk until icing easily slides off a spoon. Drizzle icing over cookies.